The 2017 Women’s March was a worldwide protest that took place on January 21, 2017. The protest was aimed at the newly inaugurated U.S. President, and millions of women took part in marches all over the world. Our friends at The Next Web were interested to see how this may have affected traffic to Pornhub. As we discovered in our 2016 Year in Review, women account for over 26% of Pornhub’s worldwide visitors, so it was only natural that we would see significant changes in the number of female visitors coming to Pornhub on January 21st. When compared to an average Saturday, we saw female traffic across the United States drop by -6.4% at 3pm (adjusted for each time zone), and a peak drop of -8.2% at 8pm in cities across the nation. Traffic from men was also down in the afternoon and evening, reaching a low of -4.3% at 10pm, compared to normal traffic levels from male visitors. In Washington, D.C. it is estimated that 500,000 to 680,000 women and their supporters took place in the protests. Traffic began to drop below normal levels at 6am, reaching a peak drop of -19% at 2pm, and -17% at 6pm, before returning to normal levels between 9pm – 1opm. 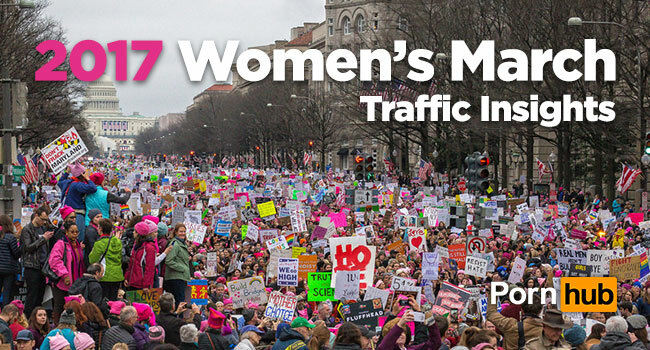 Between 400,000 and 500,000 protesters took place in the New York march, and this cause female traffic to be much lower than average throughout the day. By noon-hour, visits from women were down -12%, reaching as low as -19% at 8pm in the evening. At 11pm, which is normally the highest traffic time for Pornhub, visits from women were still down by 9%. Los Angeles had between 500,000 to 750,000 protesters take place in the January 21st march. Compared to an average Saturday, female traffic was up by 6% at 6am, possibly due to the influx of visitors in Los Angeles to attend the large protest. At 7am traffic began to plummit, reaching a low of -22% below average at 2pm, and staying well below normal levels until late into the evening. The post 2017 Women’s March Traffic Changes appeared first on Pornhub Insights.